I tell people that the most important thing I learned when I guided fly fishers was how to spot trout. That’s not to say I couldn’t spot fish before, I just got a lot more efficient because I spent more time on the water and I wasn’t fishing. Simply put I had the time to become more observant because I didn’t have the pressure of wanting to catch every trout in the river. Improving my ability to spot trout also figured into my client’s success, so there was also an incentive to get better at it. But at the time I wasn’t consciously thinking about any of this. I just kept trying to see trout so I could put my fishermen on them. The more I practiced spotting trout, the more I began to see. 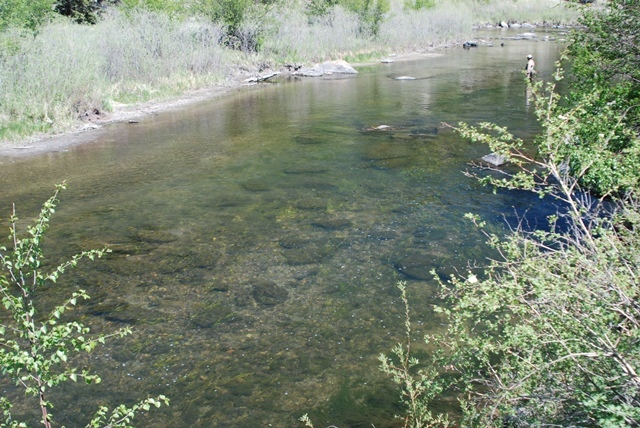 Spotting trout was possible on the tailwaters where I guided because the water was consistently clear. We spent a lot of time spotting, stalking and then sight nymphing to those trout. It’s still my favorite way to fish a nymph imitation. You get all the visual excitement of dry fly fishing, but since the trout spend the majority of their time feeding below the water’s surface you also get a lot more productive hours of fishing in the day. You also get more opportunities to target larger trout that may not rise to a dry fly. There was something else I didn’t realize when I was learning to spot trout. I was also subconsciously cataloguing the water type where I saw the trout. I was reinforcing my ability to read the water without even knowing it. I discovered this on those cloudy days when I couldn't see into the water and resorted to “spotting” the water type where I was used to seeing trout on brighter days. More often than not the trout had not moved from those favored water types even though I couldn't see them.. SO HOW MANY TROUT WERE THERE?